This is a list of glitches in the game New Super Mario Bros. 2. 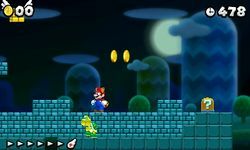 In the final castle level in World 6, Mario and Luigi should both hit the coin block. Since there is only room for one, one of them will start bouncing on top of the other and then both will start making jumping sounds at faster speeds than normal. This glitch can be done in World Star -1 and requires Super Mario. First, Mario should Ground Pound some Brick Blocks near a Brick Block with nothing below it to make it possible to hit. It has a P Switch inside that Mario must press. Then Mario must run to the second platform after the ? Switch and wait for the P Switch to wear off. Then, if done correctly, the Koopa Troopa becomes stuck inside some Brick Blocks. After turning right, it appears slightly to the right for only a split second and then return to its original position. It can still dance to the beat in the music. If done with a Goomba, the Goomba walks back and forth, confined to a single Brick Block. Goombas hop to the music, so they move up one block each time they hop. If done with a Shell, when the Koopa Troopa gets out of the shell, it moves up, however, the Koopa Troopa moves out of the brick blocks. If near the flagpole, have the Koopa facing the right and press the P-Switch. When it wears off, the Koopa still moves. When Mario is in the Super Leaf power up, he can fly with a run up, decreasing his speed. However, if the player presses both the jump button ( or ) and the dash button ( or ) multiple times simultaneously, Mario will conserve whatever speed he was running/walking with. This is a useful glitch for speedruns. 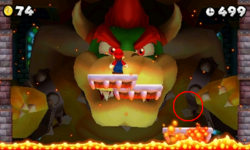 In the last level of World 6, when Mario faces Bowser's second phase, if the player looks at the bottom of Bowser's hand spike bands, there will be a floating spike on both. In the first level in the Gold Rush Pack, the player must become Gold Mario, go to an area with a Gold Ring and wait for a Goomba Tower of at least 2 Goombas tall to come by. Then, the player has to touch the gold ring and stomp on the Goomba at the top in the same jump. If done correctly, it will freeze and be unable to move. In addition, it trembles. When the Gold Ring's effects expire, the Goomba Tower will return to normal again. However, the glitch might not work every time. In the first level of the Platform Panic Pack, near the end of the level, the player must ride on the Peepa platform that takes the player to the top of the Flagpole. However, if the player stands on the right side of the platform, sometimes Mario grabs the pole in mid-air then slowly float down it. On extremely rare occasions, Mario might even go over it. For any Warp Cannon level, Mario must have a Super Leaf. Flying to the highest speed until the end of the level causes Mario to fall and jump normally. However, one can hear jump and Mario's voice a second time when he gets offscreen. On World 5-2, if the player completes the level with the third Star Coin on the first completion, the level remains red even though World 5-3 is unlocked. In World 3-3 or World Flower - , if done fast enough, Mario or Luigi can grab onto a spider web and bounce off immediately without it disappearing. 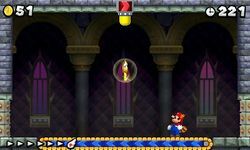 In World 6-1, if the player stands still in an empty area and stone blocks fill it, Mario or Luigi will be in front of them. However, they can jump out easily. If the player crouches, they will be stuck like so until they exit the bricks. They can also be freed by the Volcanic debris.. In the third level of Coin Challenge Pack B, the player should go to the end of the level and find a brick with a ? Switch in it near the flagpole. Then, they have to wait for the Volcanic Debris to crash onto the brick, smashing it. In the split second, they must also hit the block at the same time. Doing so results in the ? Switch popping up, but with an appearance of floating in mid-air. A example of this glitch can be accomplished in World 2-1. If Mario jumps at the tilting block platform at a certain angle he can jump through the Block (this glitch was utilized in co-op mode). The player can also do this with a Mini Mushroom. After defeating Lemmy Koopa in World Flower, the player must fly up using a Super Leaf and hit the switch. The treadmill should change color and direction along with the switch, but instead only the switch will change. ↑ YouTube video of "Koopa in the Blocks"
This page was last edited on December 18, 2018, at 03:55.